What Happened between 1964 and 1994? Journalists attended Christian Coalition and Republican Party events in the early nineties documenting the tactics of the newly formed organization. Reports appeared in newspapers around the country detailing the take over of local Republican Party committees, and efforts by moderate Republicans to form competing entities. Following are some of those articles. The rich Republicans of San Antonio's Bexar County consider themselves very conservative. And they are. But the politics of this new crowd gave them a bad scare. Not long after the Christian rightists staged their coup, the president of the Alamo City Republican Women's club just gave up and quit. "The so-called Christian activists have finally gained control," she explained in her resignation letter, "and the Grand Old Party is more religious cult than political organization. Next came the Pennsylvania primary ... the shock came the next day, when the votes for obscure Republican state committee positions were tallied. From nowhere, conservative Christians had grabbed dozens of seats. The militant newcomers are now close to controlling the Republican Party in Pennsylvania, too. In June, in the San Diego County towns of Lemon Grove and El Cajon, a slate of "pro-family" Christian right activists financed by a group of conservative businessmen swept the Republican primary for all of the open council seats, along with a slew of state assembly seats. On the same day, several hundred miles to the north in Santa Clara Country, another slate of "biblically oriented" candidates--committed to the death penalty for such sins as homosexuality and abortion--captured 14 of 20 seats on the Republican county central committee. The GOP apparatus in the nation's most populous state is within a few votes of being absolutely controlled by the Christian right. Across the nation, in primary after primary, stunned Republican leaders echoed the lament of one longtime party activist in Texas, a personal friend of Barbara Bush, who suddenly found herself ousted by the fundamentalists. "They organized and we didn't," she said. "I didn't think it was going to be this bad. What the Christian right spends a lot of time doing," says Marc Wolin, a moderate Republican who ran unsuccessfully for Congress from San Francisco last year, "is going after obscure party posts. They try to control the party apparatus in each county. We have a lot to fear from these people. They want to set up a theocracy in America. They have acquired a very detailed and accurate understanding of how political parties are organized. Parties are very susceptible to being taken over by ideologues because lower party offices have no appeal to the vast majority of our citizenry. Many precincts are represented by no one. If you decide all of a sudden because it's your Christian duty to become a precinct representative, you only need a few votes to get elected. Increasingly, they have the key say-so on who will be a delegate at the national convention, and who will write the party platform and nominate the presidential candidate. In a state like Oregon, with 600,000 registered Republicans, it is possible for 2000 or 3000 people to control the state party apparatus. If they are outvoted by one or two votes, parliamentary manipulations begin, and after two or three hours of discussion about how many angels can dance on the head of a pin, the more reasonable people with other things to do leave, and in the wee hours of the morning, things are decided. That's how they achieve their objectives. "The Christian Coalition: On The Road To VICTORY? A Special Report From Inside The Pat Robertson Political Machine," by Journalist Frederick Clarkson, Church and State, January, 1992. When I slipped into the national leadership meeting of Pat Robertson's Christian Coalition, I thought I knew what to expect. I'd written many stories about the Religious Right. But I was unprepared for what I saw, heard and felt inside Robertson's Virginia Beach, Va., headquarters for two days in November during the "Road to Victory" Conference and Strategy Briefing. Until last spring, Jo Martin was a relatively non­political Houston housewife. Today she's on the front lines of a religious war that has fractured the Republican Party. Martin, a 52-year-old mother of three, and her husband David, a stockbroker, are lifelong Republicans but hadn't been active in party politics for many years until they happened to attend a local GOP meeting last spring. They were appalled by what they found. The party apparatus had been taken over by religious activists intent on bringing "biblical principles" to government: outlawing abortion, ostracizing homosexuals and teaching creationism in public schools, among other things. "We honest to goodness felt like we had fallen through a time warp into a Nazi brown-shirt meeting," Martin said. Inside the Covert Coalition, Church and State, Frederick Clarkson, November, 1992. The wildest dreams of the Far Right in America may actually be within their reach - control of the Republican Party. A group dedicated to making the Bible the law of the land has quietly positioned itself to take over the Republican Party's power structure in Santa Clara County. The 17 Christian right candidates for the Republican Central Committee appear on a mailer put out by a Tehama County group called Citizens for Liberty. The flier says the candidates advocate "traditional family values, more jobs, lower taxes, welfare reform and choice in education." But at least some have a more sweeping agenda ... Some see takeover plans. More liberal Republicans say the Central Committee campaign is part of a widespread "stealth" effort to take over America by starting with little-noticed local races. They cite elections in San Diego County two years ago, when 60 of 90 Christian right candidates for low-level offices won election, largely by campaigning through conservative churches. A fundraising letter ... includes "a call for the death penalty for abortion, adultery and unrepentant homosexuality." Many of these links come from The Activists Handbook, by Frederick Clarkson and Skipp Porteous of the (no longer active) Institute for First Amendment Studies. Articles from the Handbook have been scanned for this site because they are not otherwise available on the web. These articles document the activities of the Christian Coalition from 1991-1993 as they began to take "working control" of the Republican Party. To read about the covert tactics of the Christian Reconstruction movement, click here. A group of Republican strategists who had worked on Barry Goldwater's 1964 presidential campaign were worried. Goldwater had been soundly defeated, and the strategists feared that the base of the Republican Party -- primarily southern segregationists and the very wealthy -- was too narrow. So they set out to expand the base calling themselves the New Right. Goldwater was not part of the New Right. One member of the New Right, Republican Strategist Paul Weyrich, founded the Heritage Foundation in 1973 -- a think tank to promote the ideas of the New Right. Weyrich also founded ALEC, The American Legislative Exchange Council in 1973 to coordinate the work of Religious Right state legislators. ALEC initially positioned itself as a counterweight to liberal foundations and think tanks, focusing on social issues like abortion and the Equal Rights Amendment, but became a magnet for corporate lobbyists. In 1979 Weyrich coined the term "Moral Majority." Their goal was to politicize members of fundamentalist, Pentecostal and charismatic churches - a constituency that had been basically apolitical. Not all members of fundamentalist, Pentecostal and charismatic churches support the Religious Right, but those were the groups targeted by the New Right. And some members of churches outside of those mentioned support the Religious Right, while many other Christian leaders strongly oppose them. "We are talking about Christianizing America. We are talking about simply spreading the gospel in a political context." Thousands of fundamentalist preachers participated in political training seminars that year, and by June, more than two million voters had been registered Republican. Their goal was to register 5 million by November. In the 1980 elections, the newly politicized Religious Right succeeded in unseating five of the most liberal Democrat incumbents in the U.S. Senate, and provided the margin that helped Ronald Reagan defeat Jimmy Carter. The year 1980 was the year that a sleeping giant was awakened, and the political landscape of the United States was dramatically altered. Many other organizations formed in the eighties. The Reverend Timothy LaHaye founded the American Coalition for Traditional Values -- a network of 110,000 churches committed to getting Christian candidates elected to office. A year later, LaHaye was co-founder and first president of the Council for National Policy (CNP), a secretive umbrella group of far right leaders who meet regularly to plot strategy designed to advance a theocratic agenda. In 1979 Beverly and Tim LaHaye founded Concerned Women for American (CWA) claiming a membership of 600,000. With prayer and action meetings, the women were, and still are a formidable lobbying force. CWA was successful in defeating the Equal Rights Amendment, and their lawyers won an important textbook case in 1987 to combat Secular Humanism in the schools. That case was later overturned by the higher courts. James Dobson, host of the radio show Focus on the Family, founded the Family Research Council in 1983 to act as the political lobbying arm of his radio show. Because an estimated four million listeners tune into his radio show daily, the Family Research Council has remained a formidable lobbying organization. In 1988 Pat Robertson ran for President in the Republican Primaries and lost to George Bush Sr. In 1989 the Moral Majority disbanded. A lot of people concerned about the Religious Right breathed a deep sigh of relief. But there was one strange event that should have been a warning sign. Pat Robertson beat Vice President George Bush Sr. in the Iowa Republican caucuses. How did Pat Robertson beat the Vice President in that state? Members of his campaign worked precinct by precinct to take over the party leadership at the local level until, eventually, they controlled the state party apparatus. Rule the world for God. Give the impression that you are there to work for the party, not push an ideology. Christians need to take leadership positions. Party officers control political parties and so it is very important that mature Christians have a majority of leadership positions whenever possible, God willing." As can be seen from the documentation on this page, one of their tactics was to tie up the meetings for hours until people left. Then they appointed themselves leaders and made key decisions. Once they took over the local leadership throughout the State of Iowa, they could control the state party apparatus. After their success in the Iowa '88 primary, they used the same tactic in several other states -- precinct by precinct. Republican State Party Platforms began to get pretty interesting in 1992. The Republican Party of Washington State in 1992 outlawed witchcraft and yoga classes. "With the apathy that exists today, a well organized minority can influence the selection of candidates to an astonishing degree." "We want...as soon as possible to see a majority of the Republican Party in the hands of pro-family Christians..."
Robertson hired Ralph Reed as the Christian Coalition's political mastermind. To get their candidates elected Reed and Robertson taught them to use stealth: avoid publicity, stay out of debates, and work below the radar screen. Don't call attention to yourself. And then Christian Coalition campaigned on their behalf exclusively in fundamentalist, Pentecostal and Charismatic churches. While candidates avoided the limelight, Christian Coalition Family Values Voter Guides were distributed to participating churches. Church telephone directories were used for "get-out-the-vote" telephone banks. By election time in 1994 Christian Coalition had distributed 40 million copies of the "Family Values Voter's Guide" in more than 100,000 churches nationwide. 1994 was the year Republicans took control of Congress for the first time in 40 years. It was also the year that Republicans made a huge gain in State Legislatures. The purpose of focusing on state legislative races was to enable Republicans to gerrymander Congressional Districts. To be sure, both parties have used the practice of gerrymandering to their advantage, but, in recent years, Republicans have elevated this practice to new heights. Up until 1994, Democrats held strong majorities in both houses of most State Legislatures. In 1992 Democrats had majorities in both bodies of twenty-five legislatures, Republicans eight. In 1994, Democrats had majorities in eighteen, Republicans, nineteen. By 2003, Democrats had sixteen, Republicans, twenty-one. 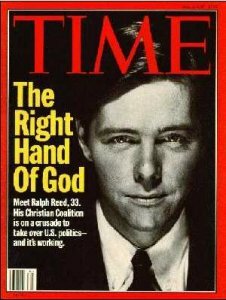 Time Magazine, in May, 1995, called Ralph Reed "The Right Hand of God" and credited the Christian Coalition with giving the Republicans their victories. Out of forty-five new members in the U.S. House of Representatives and nine in the U.S. Senate in 1994, roughly half were Christian Coalition candidates. 1996, 45 million voter guides were sent out. In 2000, 75 million voter guides were sent out to support George Bush. In 2002 - 24 million. In 2002 the Religious Right backed candidates won 18 new House seats, and 11 Senate and Gubernatorial elections. Ralph Reed resigned from Christian Coalition in 1997, it lost its tax exempt status in 1999, and Robertson resigned in 2001. The organization appears to have lost much of its momentum, but it changed the course of American politics. The candidates it has supported now reside in the U.S. Congress, state legislatures, the courts, state boards of education and more. And most of the Republican leadership of the U.S. Congress consistently receive 100% scores from Christian Coalition. Thirty-eight out of fifty-two Republicans in the U.S. Senate received 100% scorecards from Family Research Council in 2003 and forty-one out of fifty-one Senators received 100% scorecards from Christian Coalition in 2004. "As a candidate, I could see my polling numbers shoot up as those voter guides went out. I appreciate it and they work." Ralph Reed,	former Executive Director of the Christian Coalition, relied on stealth tactics throughout the nineteen nineties. He no longer needs to use stealth. As a senior official of the Bush-Cheney '04 campaign, Reed attended the annual meeting of the Southern Baptist Convention to ask pastors explicitly for their help in winning votes.